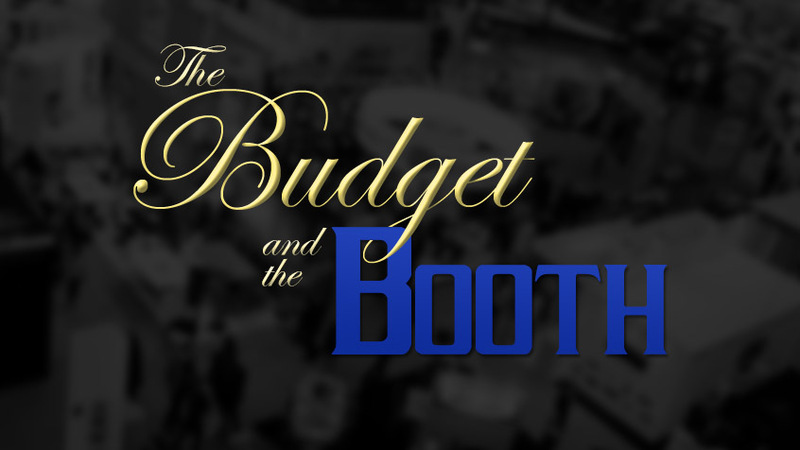 Once upon a time, at a desk not too far, far away…you receive a tradeshow budget. The boss wants to make a big impression with your new brand and exhibit at one of your industry’s top tradeshows. This is the first time your company has ever considered a tradeshow space! Excited by this fresh marketing venture, your thoughts begin to wander to the big picture end game: making big impressions, increasing sales, building brand awareness, and making a MEGA return on investments. Whimsical concepts start to fill your head as you imagine a huge footprint housing a monolithic beacon structure, larger than life swirling fabric logos dancing in the air, colorful stage lights beaming down from the rafters, sleek stylish lounge furniture, black bow-tied servers with trays of hors d’ oeuvres, and a DJ pounding a bass-driven beat. All of this to enchant and entice the high-level executives and decision makers, as if they are under the spell of the booth’s awesomeness. Truly the belle of the show! In the fairy tale story Beauty and the Beast, just about every character is wrapped up with ideas bigger than themselves. Fixated on their physical attributes and personal delusions of grandeur. Each character is thrown out of their comfort zone and onto a self-discovering journey resulting in a paradigm shift through transformation and reinventing oneself. Unbeknownst to you, you’re about to embark on a similar journey with your exhibit booth. The Enchanted Rose: The clock is ticking faster than you think. 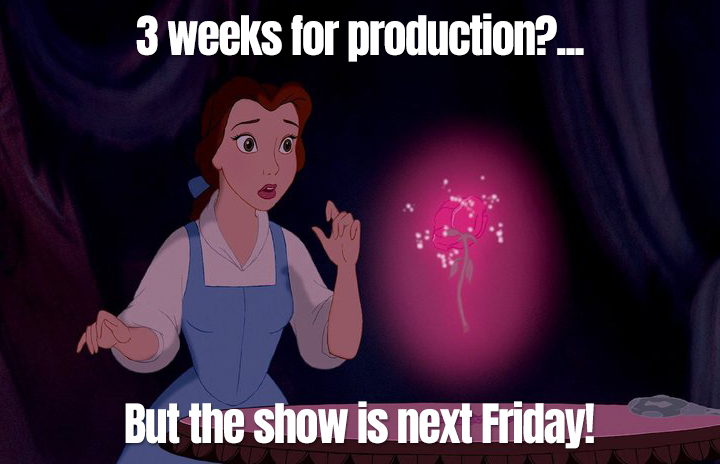 It’s now five months before the first show and your grandiose ideas have your budget quickly spiraling into the red. 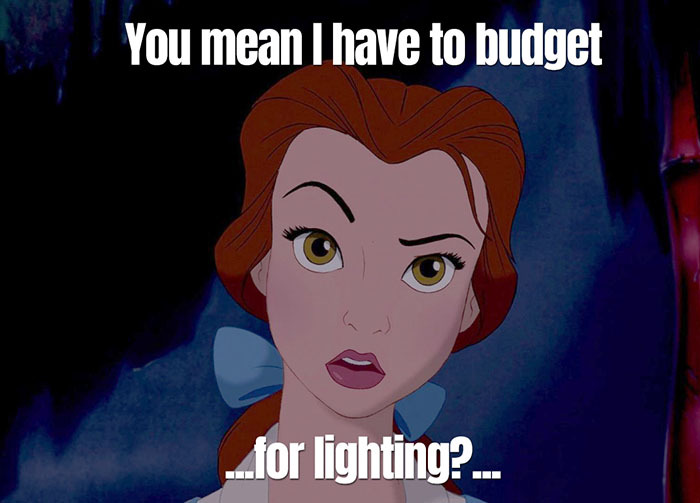 Time is ticking away and you feel bound to your budget like the curse cast upon the Beast. Each line item now has a couple of extra zeros than originally planned and you’re coming to the realization that you’re going to have to reinvent and transform your ideas while still attaining your end goal. Ugh! If only you had done the research and planned this out better rather than shopped online! In a cold sweat, cross-eyed, flipping through pages upon pages of show service manuals, you realize that you’ve completely lost sight of your brand and why you were doing this in the first place. As your head begins to slow down from the spinning, you remember that you’re NOT alone and there IS help! In Beauty and the Beast, each character, including the townspeople, struggled with their identity and had to change their paradigm to achieve happiness and success. Your proposed monster-sized booth footprint, towering structures and catered dance party will cost you big bucks in studio time, engineer stamps, labor, rentals, drayage, freight, and many other unforeseen expenditures. Plus, your beast-booth may start to have an identity crisis on the show floor resulting in confused attendees questioning who you are and what your purpose is at the show. You must ask yourself: Does this concept align with my brand and budget? Will I get the desired value from the booth AND the show? Staying true and authentic to your brand is the first step to a successful show. Knowing the value of your brand is one thing, and fully understanding how and where to market it without breaking the bank can be a bit of a challenge. The importance of consistent branding can speak volumes, with a rippling affect to the eyes and ears of your audience. According to The Center for Exhibition Industry Research, 81% of attendees at a recent show agreed that trade shows help attendees become aware of new products and services. (2017 CEIR Index Report). In other words, your audience is primed and ready for your brand, so you need to be ready to take advantage of it. Even though Belle lived a simple life in a small, provincial town, her demeanor left a huge impression on the townspeople. A simple booth can be just as effective. Downsizing your footprint and opting for a pop-up exhibit system can save on associated asset costs, exhibit space costs, freight, labor, material handling, lead retrievals and added complications. Clean lines, compelling design, and brilliant graphics go a long way. Consider easier set ups with less stuff to fill the booth. Truly, less is more, and simpler is better. When you’re new to a trade show, it’s best to bring a pared-down booth to the first couple of shows, while implementing some unique strategies to augment the experience. A prerecorded video loop of educational and compelling content playing on a monitor or tablet can easily get your message across. Excite your booth guests with interactive surveys, contests and chances to win prizes, meanwhile you can obtain crucial lead data. Rather than renting the monitor and tablets from show services, consider purchasing these assets. A general rule of thumb is that if you rent three times then you’ve essentially bought it. You may come to find that purchasing the monitor could end up saving you thousands of dollars. I’ll say it again–thousands of dollars! There’s always room to explore new strategies to entice, surprise and engage with your audience. Could VR or AI be the way to achieve your goals? Can you take this campaign on the road to other markets with a hyper targeted experiential program? 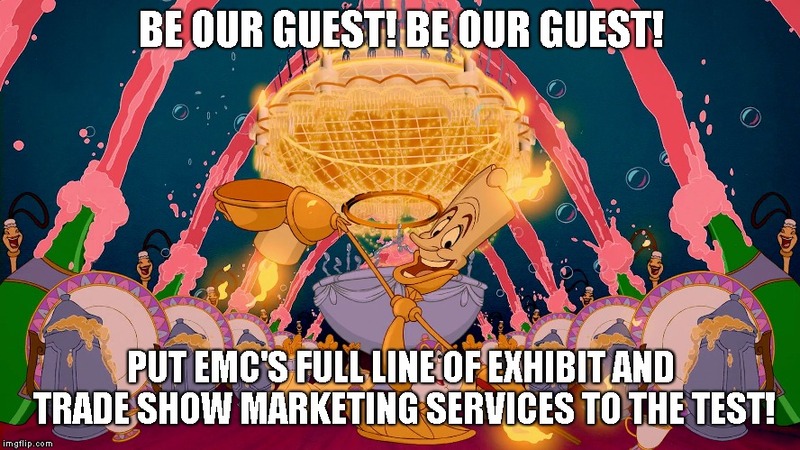 Just as Chip was a valuable companion to Belle while she lived in the Beast’s castle, blue-chip companies can be your best friend at a tradeshow. Selecting even a small footprint space near the industry’s blue-chip companies can guarantee you more visibility, increased foot traffic, and longer dwell time in and around your booth. Inadvertently the mind of the attendee will make a phycological connection between your booth and theirs, resulting in a cost-effective show floor technique and better ROI. 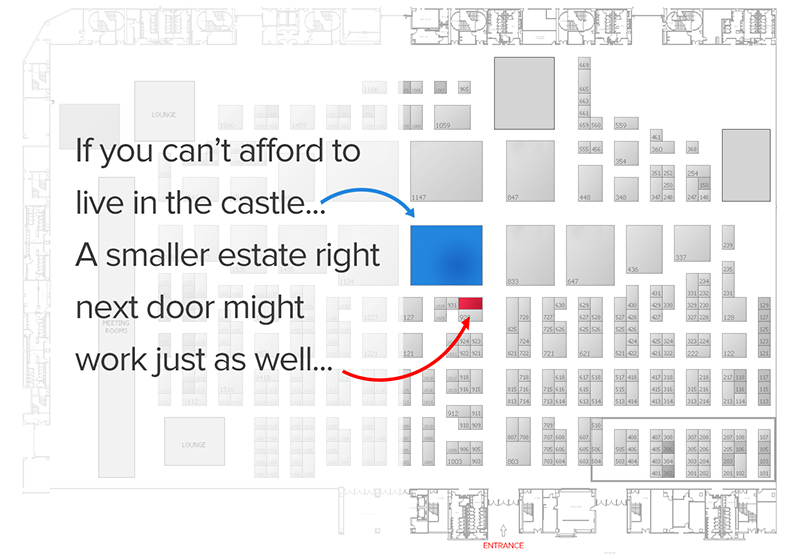 Identifying the right location on the show floor can be a powerful game changer. Choose locations near main traffic aisles, corridors, center footprints in the show hall, near public spaces such as restrooms or near your industry’s big players. Researching and investigating your potential neighbors and walking the show floor could help you understand who they are, what they offer and how they are pulling in foot traffic. Your neighbor could perhaps be your next best industry partner bringing fruitful business to the both of you. In other words, the baker in Belle’s village couldn’t possibly bake his bread without his partnership with the guy who forges the trays! Your booth should be equipped with a strong dream team starting with the right staff. Did you know that 85% of an exhibitor’s success lies in the performance of the staff? (2017 CEIR Index Report). Do you have your dream team to support your brand and get your show in motion? Your dream team can consist of educated brand ambassadors, a strong sales team, strategic media planners, design consultants, designers, event coordinators, tradeshow coordinators and meeting planners; all which will help you balance your budget while aligning the expectations and goals gained from the booth. The moral of THIS story is similar. With the guidance of a strong partnership and the willingness to make some sacrifices or changes while staying true to your brand, understanding your budget and booth can develop into a fairy tale ending for your business. Truly, a tale as old as time! 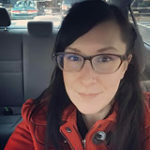 Lauren brings over a decade of experience supporting events and trade shows. She has coordinated programs of all shapes and sizes, such as grassroots nonprofit events, international product launches, road shows, trade shows and multi-platform OOH campaigns. She enjoys developing new relationships with creative people, traveling to interesting places, and having impactful experiences.